I grew up in Singapore, and lived there for the first 18 years of my life. From a young age I’ve always been drawn to artistic pursuits, taking art classes, Chinese painting and calligraphy. I would say I had a somewhat traditional Asian upbringing. While my parents never discouraged me from being creative, art was always just more of a hobby. Whether it was peer or societal pressure, there was an unspoken understanding that pursuing art as a career wasn’t a practical choice. I ended up studying architecture at Cornell University, thinking it was a good balance between art and science. After graduating, I worked as an architect in New York City, which is where I met my husband Rolfe. Still evolving. My design skills were honed in my years of architecture practice. I dabble in photography. I’ve always loved creating things, and knew I wanted to do something that involved making with my hands. At the present moment, I still feel uncomfortable calling myself an “artist”, since I’ve had no formal training and have yet to figure out the many aspects of making a living from this craft. But that’s okay, it’s all about the journey, not the destination. Coming from New York, what prompted your eventual shift to living and working here in Saint Paul? After more than a decade of living in New York City, Rolfe and I felt a certain sense of restlessness. So when a job opportunity in the Twin Cities arose for Rolfe, we weighed the pros and cons and decided it was time for a change. We had never visited Minneapolis–Saint Paul before, let alone considered a move here. But it really is a great place to live. How does living in Saint Paul influence your creativity or the work that you do? Rolfe and I love to visit the many museums and galleries in the city, as well as attend live music events and performances by the Saint Paul Chamber Orchestra. 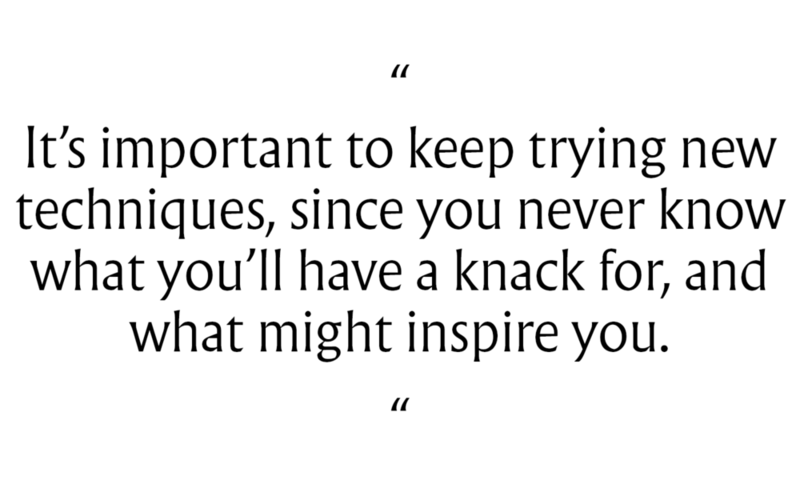 Inspiration can truly come from anywhere and everywhere. I do regret that I haven’t really connected with the local creative community since moving here. It’s something we are working on. I work out of a small home studio, and have inadvertently become more insular. Participating in the American Craft Show in Saint Paul is really a first foray into networking with local makers and crafters, and we’re really excited about it. What do you find interesting about paper as a medium? How did you come to find bespoke paper art? The reason I was initially drawn to paper is because of its availability and ease of use. It’s not an intimidating medium; everyone has experience with paper. My path to paper art unexpectedly started in 2016 when I was searching for personalized name gifts and couldn’t find anything I liked. So I decided to make some customized gifts myself. Using pre-cut paper strips, I started rolling paper coils, totally fell in love with the process, the repetitiveness of which I find both meditative and relaxing, and have been working with paper almost every day since. How did your business, JUDiTH+ROLFE, come to be? Rolfe and I had mostly been anti social media, but I loved the results of the first paper gifts so much that I started an Instagram account to share the work. Drawing from my architecture background, in addition to the custom name pieces, I started experimenting with geometric shapes. Quite early on and totally unexpectedly, the design blog Design Milk featured one of my geometric pieces. A lot of interest was generated from that one post, and people were contacting me for commissions. That’s when we decided, okay, maybe this paper thing is more than just a hobby, we should start a LLC. Social media has really been a blessing in that regard. The technique can broadly be called “quilling” since I primarily work with strips of paper, though I like to say I come at it with my own take by using a unique and contemporary approach. Traditional quilling or paper filigree work consists of rolled paper strips manipulated into various decorative shapes. Those shapes are then used to create an image. In my method of working, instead of using the decorative shapes typically associated with quilling, I treat each strip of paper as its own line. The paper is still kept on edge and glued down individually to create the artwork, not unlike sketching with paper. My preferred process is to make unmounted pieces, meaning the paper strips are glued to each other but not glued down to the background panel or substrate. I’m not sure I can say I have a distinct style yet, although I always try to keep the designs clean and simple. Your work has themes of architecture, geometry, nature, and typography. Could you share some of the buildings, natural elements, or artwork that have inspired your creative voice? I like to reference a variety of components from nature and architectural geometry. Some of my recent inspirations include Japanese Kumiko screens, Islamic tile designs, Rosemåling, Art Deco details, optical illusions, wallpaper patterns, album covers, vintage botanical illustrations... the list goes on. By not allowing myself to be pigeonholed. In addition to quilling, I like to practice with different paper manipulation techniques, such as cutting, folding, sculpting. I have great admiration for artists who do the same thing over and over, refining their concept to see the ramifications of one minor tweak, to finally get whatever it is they are working on. Perhaps I lack the discipline, or maybe I don’t have the mindset of an artist, but I could never make a similar piece over and over. Repetition during the pursuit of completing a single piece of art is fine, but once that artwork is done, it’s actually difficult for me to continue in the same theme for very long. Rolfe and I have also been exploring alternate creative disciplines. We’ve recently attended a leather-working workshop and are planning on taking a glass blowing class. It’s important to keep trying new techniques, since you never know what you’ll have a knack for, and what might inspire you. I can be somewhat of a perfectionist, which is both a positive and negative trait when it comes to creating artwork. There are times, and I’m speaking generally, in life, where I would rather not do something just because I think it won’t be to the standard that I expect. We can be our own worst critics. 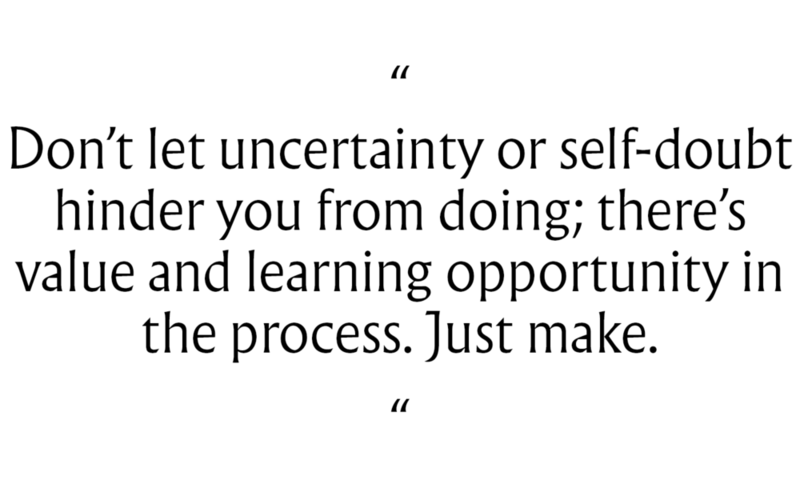 Don’t let uncertainty or self-doubt hinder you from doing; there’s value and learning opportunity in the process. Just make. All photos taken by JUDiTH+ROLFE. View JUDiTH+ROLFE’s work at judithandrolfe.com. Learn more about the American Craft Show in St. Paul at craftcouncil.org/stpaul.